Tuesday marks the Lunar New Year and the start of the Year of the Pig, but some Clevelanders got an early jump on the festivities this past weekend. Among them was Wayne Wong, Vice President of the Cleveland Chapter of an Asian American advocacy group called OCA. Wong led a dragon dancing troupe at a New Year celebration event Sunday at Asian Town Center, a shopping mall in Cleveland’s AsiaTown neighborhood. 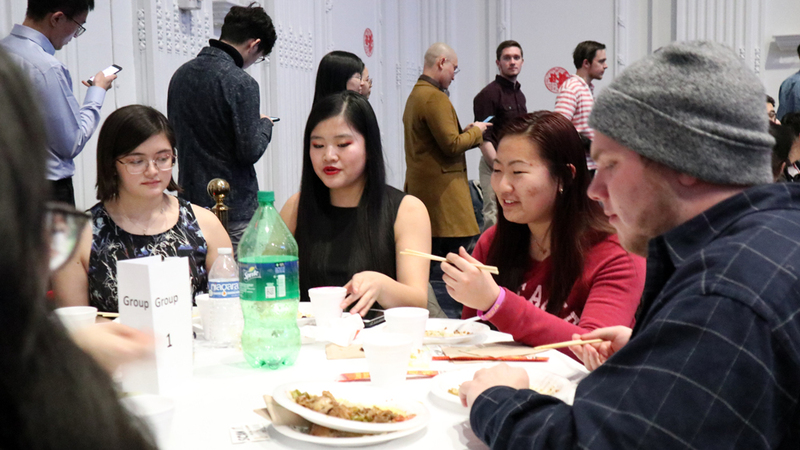 “Lunar New Year is similar to, in Western culture, New Year, Fourth of July, and Thanksgiving all rolled up into one,” Wong said. Earlier in the day, performers from Kwan Lion Dance set off thousands of firecrackers which, for more than a minute, filled the parking lot of the mall with sparks, smoke, and ear-pounding noise. The barrage was following by a drummer accompanying a pair of dancers in a technicolor lion costume. As the dancers strutted around the parking lot, bystanders took turns stuffing little red envelopes filled with cash into the lion's mouth for good luck. Spectacle, however, is but one aspect of the Spring Festival, a series of celebrations that, in the Chinese tradition, runs about two weeks. (This year, it begins on Feb. 5 and culminates on Feb. 19 with the Lantern Festival.) Equally important is the holiday’s emphasis on food and family. “The New Year meals are probably my favorite meals of the year,” Wong said. “The most important thing is the family gathering together,” said Susan Cheung, who was at the event with her daughter, Angie Piper. The exchanging of red envelopes—called hóng bāo (紅包)—filled with “lucky money” is a tradition in many Chinese families. It’s common for Chinese parents to give hóng bāo to their children, with little kids getting the equivalent of maybe $10 or $20, and older ones receiving more. For parents with unmarried children, it can be like a little nudge. “Here's the money to buy new clothes … and hopefully you can find a good, lucky spouse,” Piper said with a laugh. As she held her little girl, Piper said she’s keeping up the hóng bāo tradition. And for this generation of givers and receivers, there are now electronic ways to exchange lucky money. Last year, Angela Wang, a freshman at Case Western Reserve University, used the messaging app WeChat (owned by the China-based tech firm Tencent) to upload "digital" packets of "lucky money" to their group chats. In a twist on the custom, participants who are the first to click the red envelope icon on their phone screens get a piece of the cash, and those who are too slow, get nothing. As a result, Wang said, it got pretty competitive. “There have been times I've seen my mom or family friends sitting there like, ‘Someone's about to send one. I have to click it. I have to be ready!’” Wang said. But, she said, it brought the family together, which is what the holidays are about, right?